Stunning silver and diamanteladies evening sandal. Diamante encrusted twisted band across the toes up the foot to add a bit of sparkle to your feet. 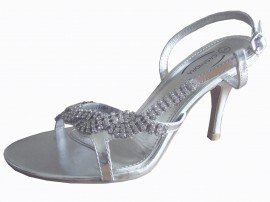 8cm heel with padded insole for that extra added comfort while dancing the night away.